We all know that team dynamics aren’t set in stone. There are good days and then there are ‘my-team-is-driving-me-mad’ days. Letting teammates know how their behaviour is supporting or hindering each other’s work may seem less daunting to share if you’re working in the same location because you get to mention this in-person. But remote teams don’t have that luxury. As a remotee, you have two options: you can send feedback in a message or give it during a video call. From my personal experience, I think there’s still a lot of room for improvement for giving feedback in both these ways. Ever since I became location-independent two years ago, I’ve been intent on setting up a process that would allow my remote team to give each other open and transparent feedback. Not individually, but as a group. Most experiences with feedback in a work environment are annual performance reviews. These are usually top-down, one-sided conversations that rarely leave a huge impact on you once you leave the meeting room. I really learnt how effective feedback can be outside of work, when I quit my job as a graphic designer to study at Hyper Island. Barely a week into the Masters programme, all students had to give each other feedback. We were told to stand in two long lines facing each other and we were given 30 seconds to say something we appreciated about the person facing us. After exchanging some superficial compliments with our partner, we had to move down the line and repeat the process. It was a brief exercise with 23 people simultaneously chatting and sliding to the side in an awkward line dance — an innocent introduction to “feedback for dummies”, minus the music. After this inaugural choreography, we were split into teams and started working on client briefs. Working in a new group came with a lot of challenges, especially while you’re discovering each other’s personalities and distinct ways of collaborating. 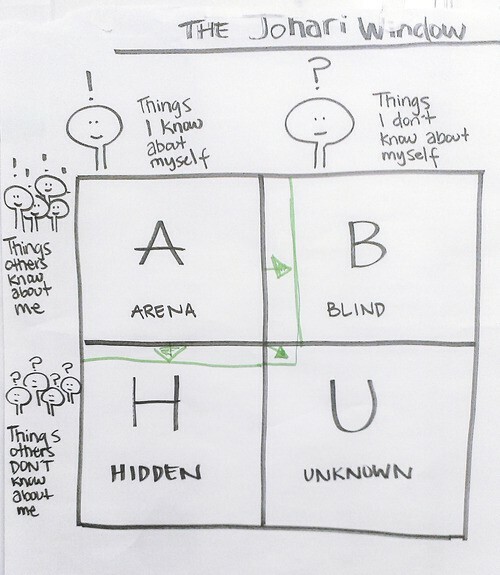 A couple of weeks into our first module, we learnt about the Johari Window, a concept used in psychology to improve relationships in groups. The idea is simple: in order to build trust within a team, every individual is encouraged to open up and regularly share their personal experiences and feelings. In turn, this helps others understand them better and provide the support they need to work more effectively. Ideally, you want to expand your “Arena” into the “Unknown” area as much as possible. Think about the last time you received a gift. If it was another handknitted Christmas jumper from your grandmother, you might have said “Thank you!” even though you knew you’d wear it zero times in this lifetime. If you received a pair of earrings from your friends (even though they should have known your ears aren’t pierced… this actually happened to me), you might have questioned your friendship but managed a confused “Thank you?”. And if your boyfriend gave you a watch on your 18th birthday just after you broke up (this happened to me too, weirdly on the same day as the earrings), you might not want to keep the watch but still said “Thank you…” (then proceed to tell him to return the watch or give it to his mother). It’s the “thank yous” (and also the fact that I had a crappy 18th birthday). It’s normal to thank people for their gifts, regardless of what they’re giving us. We can always decide later whether we want to keep the gift, give it away or chuck it in the bin. So remember to always thank the person who gave us feedback before choosing what to do with it afterwards. Many people’s initial reaction towards feedback is to go into defense mode because we feel personally attacked. By trying to empathise with the person who feels uncomfortable with our actions though, we can gradually improve our relationships with others and with ourselves. 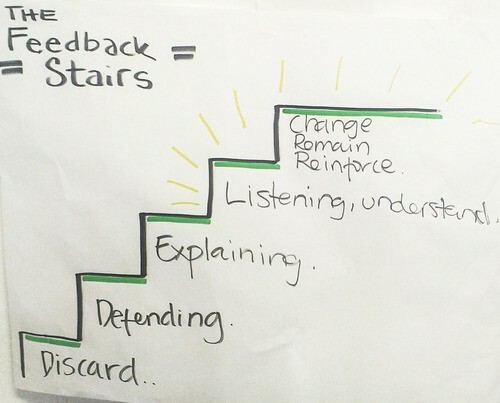 The Feedback Staircase below shows how taking steps towards more positive reactions can lead to a stronger personal development. 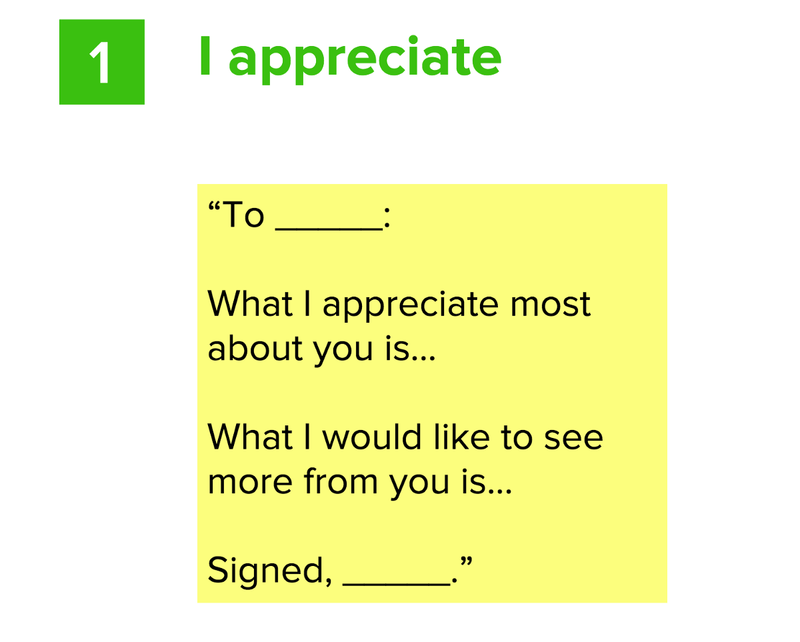 At Hyper Island we experimented with different forms of giving feedback. The most commonly used models were the “I appreciate” and “Start, Stop, Continue” formats. Usually we would give feedback to each other after a team reflection, but we would occasionally run ad-hoc feedback sessions in the middle of a project if we felt the need for it. Yet today’s outcome-driven work environments seem to have forgotten that we are people with private lives and personal baggage that influence who we are and how we behave with others. Being capable of opening up and allowing ourselves to be vulnerable with the people we spend most of our time with is probably one of the best things we can possibly do for ourselves — and it just happens to make teamwork more effective too. Having experienced the benefits of giving feedback in a group, I knew I had to introduce my team to the idea of feedback eventually. I was the newest Hanno shipmate and I was eager to bring many of the methodologies I had learnt in my course. 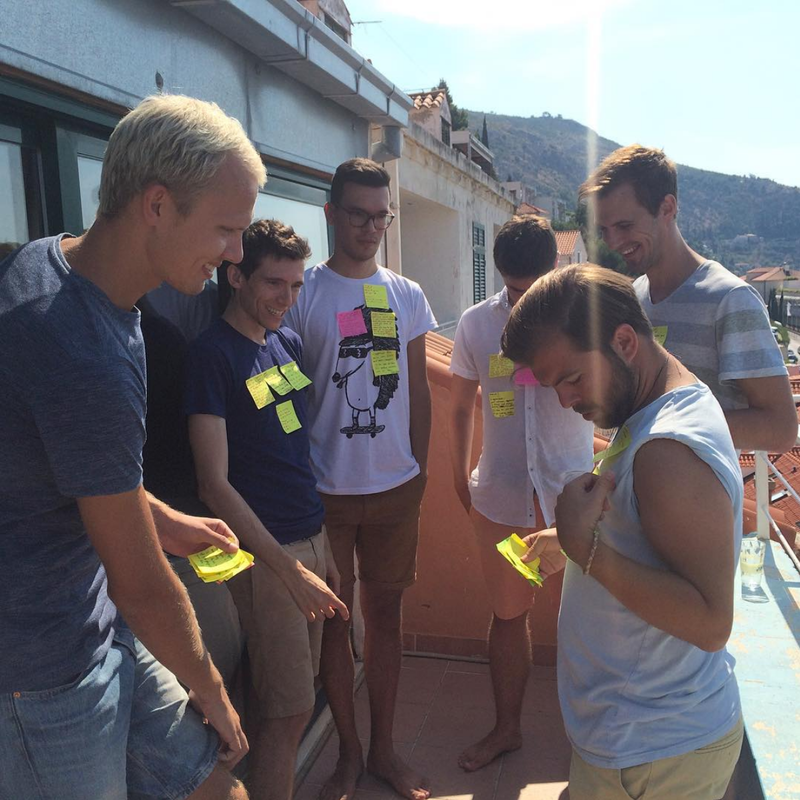 So during one of our team retreats, we gradually started using daily check-ins to communicate how we were feeling each day and by the end of the trip we had our first group feedback session on a sunny balcony in Dubrovnik (with views of famous GOT landmarks, yes). I have to admit, I was really proud of this first step but I had no idea how we were going to continue giving each other feedback virtually once we all returned home. As I predicted, we didn’t continue. In fact, for a year and a half, nothing happened. We were all so caught up in client projects that most of us forgot about it, except I knew I had to bring it back. More so when I found myself in awkward situations and wanted to give someone feedback but didn’t know how to because we hadn’t set up a feedback process. All that changed when I attended the Out of Office webinar for remote workers. I was blown away by Dino Anderson’s talk on ‘Values of a humane remotee culture: empathy, trust and inclusiveness’ which spoke straight to my emotional-intelligence-obsessed heart. Everything he was saying about bringing your whole self to work and how to build a remote team culture made a lot of sense and I knew there was so much more I could learn from him. It didn’t take long for me to reach out to Dino and tell him not only how inspiring his talk was (I cannot recommend it enough, so do watch it), but also get his advice on how to setup a remote feedback session with my team. Dino giving me feedback on my feedback. Much meta. Almost two years after joining Hanno, I was finally ready to adapt my feedback experience to my team’s online environment. We used a combination of Zoom, our favourite video conference call software, and MURAL, our go-to online collaboration tool which I also use a lot when I facilitate online workshops. Initially, the plan was to work through the template in 1 hour with the whole team in Zoom. 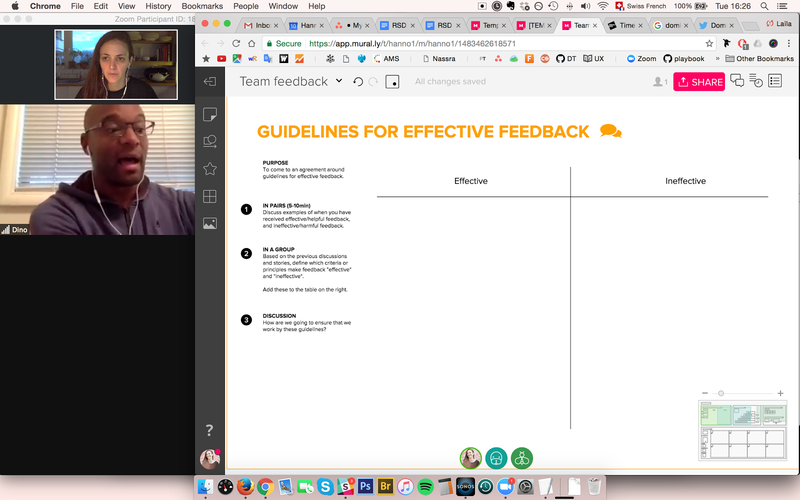 I soon realised that I massively underestimated the time it would take to refresh my team’s memory on how to give feedback, so we ended up splitting the feedback session into two 2-hour sessions. The first session focused on the exercises on the top row (view it on MURAL). Thanks to Dino’s advice, I really understood the importance of starting out by explaining the purpose of feedback. This may seem obvious, but when you’re introducing feedback to your team for the first time, it’s essential that everyone can see the value of doing it for the overall well-being of the team. It’s also critical for them to understand the distinction between constructive feedback and a performance evaluation — I was focusing on the former and I wanted to make sure I emphasised that this wasn’t about evaluating how people performed on projects, but rather about how people’s behaviours supported or blocked our team. I also brought up openness and transparency, two core values in Hanno’s culture. These guidelines give our team a framework on how to give feedback effectively and can be rewritten in future as we continue to improve our process. The rest of the session was spent discussing the Feedback Staircase and sharing some tips on how to receive feedback. On the MURAL, I added 3 feedback models that the team could choose from. For our first session, we went for the “I appreciate” model. 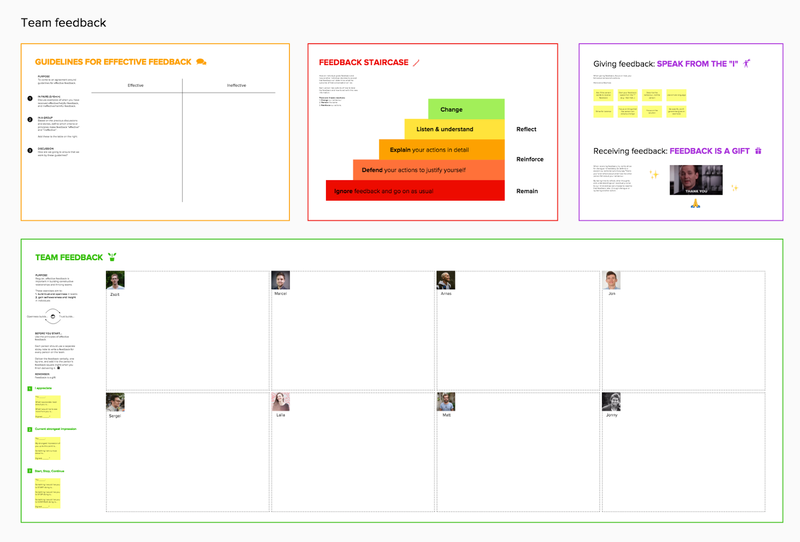 A week before our feedback session, I asked each teammate to write down feedback for every person on the team in a private Google Doc using this model. One week may seem like a lot of time, but it turns out that most people really needed that time to think about what they wanted to say to others. There were 8 of us on the call and the entire process lasted about 2 hours but it was well worth our time. After an intense year jam-packed with client projects, I was starting to sense that our culture was suffering. Some of us were feeling isolated, especially those who were working solo on internal projects and had less opportunities to interact with other teammates regularly. I feel like that has changed ever since we did our first remote feedback session at the beginning of this year — there’s a more vibrant atmosphere online, the conversations in Slack are livelier and everyone is more willing to reach out to others for spontaneous calls to catch up and find out what others are working on. Sharing feedback openly as a team created a special bond between us even if we had done the entire process online. Being open and allowing ourselves to be more vulnerable brought us much closer because we connected on a more personal level. I’m sure the fact that we knew each other already and had met on team retreats also helped, but telling each other how we felt about each other strengthened our relationship even further. It’s definitely re-energised the team and although there are still a couple of things we can improve in the process, we’re aiming to make feedback sessions a regular part of our remote culture. Originally published at logbook.hanno.co on March 16, 2017.